Framing The Future is ArtsWorcester’s first major campaign—to return our galleries to the heart of downtown and secure our future. An extraordinary gift catalyzed this project. To learn about how we are recognizing and thanking donors, click here. To see who those donors are, click here. To learn about our five-year pledge period, and all the ways to give, click here. To learn about our matching gift opportunities, click here. A quick sketch of the situation: ArtsWorcester’s current tenancy in the Aurora has significant limitations. • Two-thirds of the exhibition space is inaccessible to disabled visitors. • Plumbing problems bring water regularly through ceilings, threatening artwork and records. • The electrical wiring is inadequate for our exhibition and office needs. • Insufficient heating and cooling make a poor environment for artwork and uncomfortable conditions in every season. • Present video and conceptual art. Audiences are hungry for high-quality professional art, with 300-500 people attending each of our openings. But removed from the downtown restaurants, cafes, theaters, and creative businesses that make a thriving urban environment, ArtsWorcester’s full potential remains untapped. Now, we have a fresh canvas. The Davis and Wade family, deeply rooted in Worcester and owners of the Printer’s Building on Portland Street, has invited ArtsWorcester to establish a permanent home in downtown Worcester. 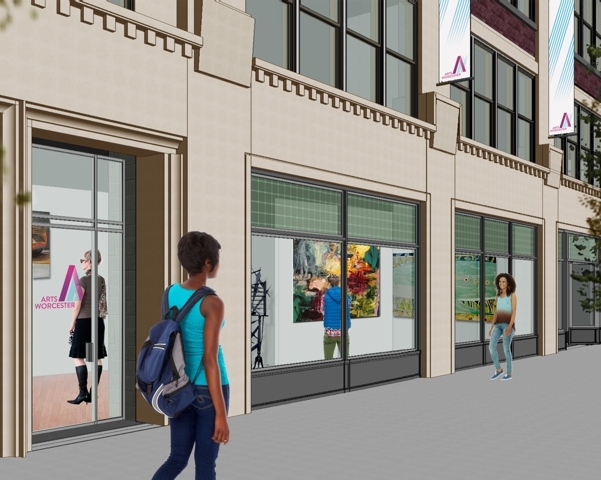 This transformative opportunity includes the design, internal demolition, and “white box” preparation of new galleries, offices, and storage space on the building’s first floor, without an increase in rent. A flexible floor plan allowing for immersive installations and video art, and increased capacity to exhibit work. Fourteen-foot ceilings, original wooden floors, and renovated windows for a classic, inviting gallery environment. increase entertainment and cultural engagement options for all who live, work, and play downtown. The art community has passionately and loyally supported ArtsWorcester for decades. On their own, though, they can’t make this move possible. For nearly forty years, ArtsWorcester has been an effective and prudently managed non-profit. Framing The Future, a five-year, $1.25 million dollar campaign, is modest when compared to those of peer institutions. Yet it will transform ArtsWorcester, establishing the organization in a permanent home in the heart of downtown Worcester and securing our future. Furniture for reception areas, artwork storage, and work stations. explore and implement new programs and partnerships made possible by the new location. and provide a vehicle for future gifts. Thanks to gifts and pledges made by foundations, individuals, and the Massachusetts Cultural Facilities Funds, we have already raised over one million dollars. We ask you to join us to celebrate high-quality, contemporary art in our city, and to ensure its future. Please support Framing the Future to secure ArtsWorcester as a vibrant part of our re-imagined downtown. Looking west, towards Portland Street. Learn more about how we are recognizing gifts to the campaign, and ways to give here.